Does your kid love cheese and nachos? This bento recipe consists of a snazzy bed of tortilla chips nachos topped with crushed avocados and melted cheese, served with a fresh salsa. Recipe and photo courtesy of Mission Foods. In a heatproof dish, top original tortilla chips with avocado, scallion and sprinkle the cheese on top. Bake in oven at 180°C for 5 minutes until cheese melts. Add all ingredients together with a dash of salt. Mix well. Alternatively, add all ingredients into a food processor and blend well. Place Tornado Chips into one side of the bento box. Pour salsa into a little silicone cup to go with the chips. To make it more interesting, place one hard-boiled egg (still warm) in an egg mold. Close the mold firmly, dip quickly into a bowl of cold water and leave for at least 10 minutes before removing the egg. 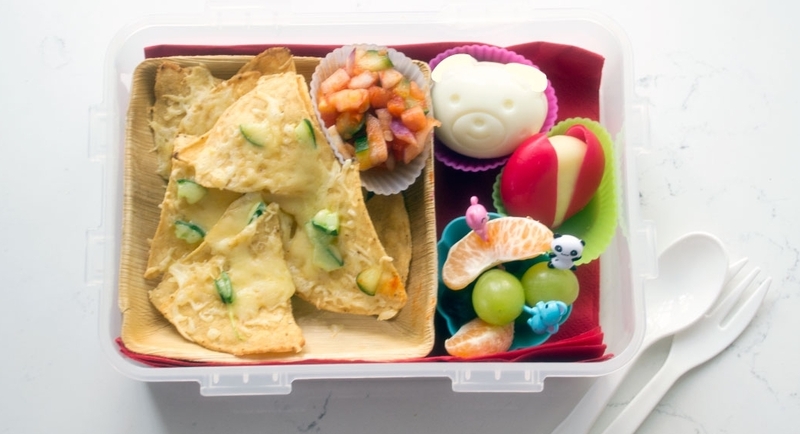 Style the bento with the egg, the mini Babybel cheese as well as a few pieces of oranges and grapes into the Tornado Chips Bento for a colourful and tasty lunch.